What Must the Knicks Do, Sans ’Melo and Amar’e? 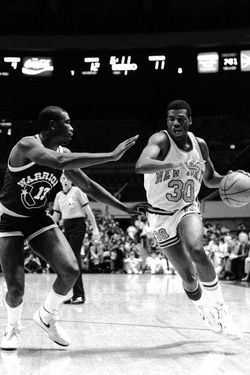 Bernard King played in fourteen NBA seasons, including four with the Knicks. The Brooklyn-born small forward had his share of memorable nights while with New York: He scored fifty points in back-to-back games in 1984, and once dropped 60 on the Nets on Christmas Day. In 2009, he was honored at the first Knicks Legends Night, and on Fridays this month, and for select games throughout the season, King is serving as an an analyst for the MSG Network. (He'll be working this Friday's game against the Lakers.) King spoke with The Sports Section about Carmelo Anthony, life after basketball, and shooting hoops with Gabe Kaplan. Carmelo Anthony has talked about being a fan of yours. What goes through your mind when you see quotes like that? There is a connection from what I understand with respect to Carmelo having patterned his game after certain aspects of my offensive style of play. And to have a great talent like Carmelo say that publicly was a tremendous honor for me. I actually filmed a commercial with Carmelo Anthony — I think it probably was about four years ago, maybe five. His first Nike commercial, nationally. And that was my first opportunity to meet Carmelo. He’s an exciting talent, a great basketball player, and I know that for Carmelo it’s an exciting time to be playing in New York City. Obviously, the club has struggled this year, but I don’t see that continuing throughout the remainder of the season. Did Carmelo reach out to you about what it was like to play in New York? No, we had never spoken about that. When he was part of the Denver Nuggets, I learned that I was his favorite player, and he would actually watch game tape of me, trying to emulate some of my moves, and I see some of that in what he does, in terms of his spin moves, how he raises the ball over his shoulder to get the defender to reach, and then he swings underneath to effectively drive right or left, and those are moves that I executed. So I do see similarities in our style of play. Certainly, I could not shoot the three-point shot; I was not a three-point shooter, and he is. But I enjoy watching him play. There’s no question about it, he’s a great player. And having been born in Brooklyn is not too bad either. Was there a particular player whose game you emulated? I did not have an opportunity to watch many games, and the reason for that was I spent all of my time, other than when I was in school or doing homework or in the library, I spent all my time playing basketball. And so during the years that the Knicks were on over-the-air, free television, I was in the mind-set of playing basketball. I played basketball every moment I could, but my favorite player on the Knicks was Dave DeBusschere, and the reason for that was I was a rebounder. I was noted for rebounding as a young player. I could score, but I loved rebounding with a passion. Dave DeBusschere was a great rebounder, and that’s what I respected about him, and so I tried to rebound like him. By the way, Dave DeBusschere was the general manager with the New York Knicks when I left Golden State as a free agent to join the Knick organization. And I had the chance to tell him that after they signed me. You worked in broadcasting for a time, and now you work in the energy business. Is that something that always interested you? Well, I recall something my daughter said to me at one point, as she started to get a little older and she could think thoughtfully about things. And we always recycled, and my daughter wanted to know why were we recycling, and why do I always need to turn the lights out if she’s not in the room. And so we sat down and had a long discussion about the importance of that, and how we can contribute to future generations by doing each of those things that I’ve mentioned. And a lightbulb went off in my head, no pun intended. I started to think, Where could there be a fit for a company that could help to specialize in energy efficiency and reduction? And so I started to explore that area by learning more about it and understanding it by studying on the web and reading everything I could about the subject. And I’ve always believed there isn’t anything in this world that you can’t learn. If the information is available, then you can learn it. My business partner happens to be a former engineer by trade; he brings that to the table. We’re very complementary to each other. I structure contracts. That’s something I’ve always done. I’m very good at that. One last question: You appeared in a movie, Fast Break, starring Gabe Kaplan. How did that come about? Fast Break! Go on the Internet, you’ll see some clips [laughs]. When I was with the Nets, I received a call from my representative at the time indicating that there was a director that contacted their offices and he was interesting in casting me in a movie. And I spoke with the director on the phone, and they told me when and where I needed to be on a particular day in Manhattan, and what time. I said, "Certainly, I’ll be there." And I distinctly recall driving through the Lincoln Tunnel — I resided in New Jersey at the time — and so I’m driving through the Lincoln Tunnel, and one of the things that was a very strong suit of mine throughout my professional career was visualization. And I use it in every aspect of my life, in terms of wanting to accomplish something. So I had a conversation with myself that I’m going to get this part. I want it, I’m going to get it. And that’s kind of the drive I had playing basketball. But here’s the unexpected thing that developed when I arrived: I thought I was going to be the only guy there. I walk in, and the room is filled with a lot of other people. I didn’t anticipate that. I thought I was going to have a reading, and they’ll decide, okay, we want Bernard, or we’ll pass on him. And so they were all there for parts as well. I read for two characters actually: Preacher, who turned out to be [played by] Mike Warren in the movie. And Mike played for UCLA with the great Kareem Abdul Jabbar. I also read for another character, the Hustler, and that was the part I actually wound up receiving, which turned out to be the third largest role in the movie. When you went in to read, was there anyone else there auditioning that you recognized? They had readings on both coasts. They had readings in New York, and they had readings in California. And I was aware that Marques Johnson was reading in L.A. And Marcus was my nemesis, and I say that in a very positive way. Marques and Walter Davis, who played for the Phoenix Suns — they were considered the two outstanding small forwards coming into the league, and I was third, behind those guys. And so when I learned that Marques was reading for that spot was well, I thought to myself, I have to beat Marcus out for this — just as I thought I had to outplay him when I stepped out onto the floor. He was a great player. So to win that role, and knowing that Marques went up for it, I felt gratified about that. But also that movie had Harold Sylvester, who played for Tulane University. He went on to be a great Hollywood actor, producer, and director. And then Mavis Washington, the woman in that movie — Mavis played collegiate basketball as well. We had some wonderful games during the times that we weren’t filming. It was a great deal of fun. And Gabe always thought that he could play, so he was part of that also. Gabe wasn’t much of a shooter. But he was a good defender.